Here's the target from the first "Gold Service" test I've made of an AR2078B air rifle. 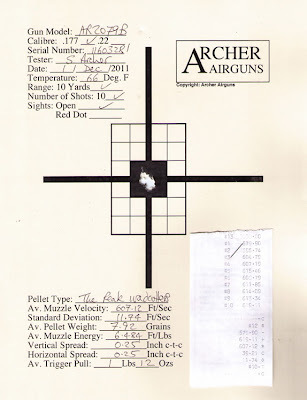 This is about the best 10-shot group I've ever produced from a QB78-family air rifle in our standard test conditions, and confirms the factory's claims of increased accuracy for this model. It's also interesting to see how similarly-shaped was the group I shot compared to the factory test. (See the previous blog post right below this one). In accordance with our standard "Gold Service" testing, I used " the Peak" wadcutter pellets straight from the tin. I've no doubt that there's more accuracy to come from the AR2078B with careful pellet selection and experimentation. And - of course - with a better shot than me pulling the trigger! The sidelever cocking mechanism was fast and easy to use. I would say it's definitely a step forward in ease-of-use for those shooters who find the standard bolt action to be a little tough in operation. if you remove the barrel of the ar2078b, you put a pellet and you push with a stick, you can feel the end of the barrel has choked. For this reason the accuracy of the Ar2078b is better.